What Do Sports Psychologist Do? Sports psychologist can help athletes overcome fears, such as fear of failure, fear of embarrassment, and general performance anxiety. This is common among athletes who are perfectionists or highly dedicated athletes that worry too much about what other people think about their performance. The most common role for a sports psychologist is to teach mental skills for enhanced performance. 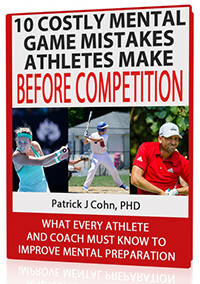 A mental game expert can help you improve confidence, focus, composure, intensity, and trust in athletic performance. These mental skills help athletes improve performance and can help in other areas of an athlete’s life. Another common role of a sports psychologist is to help athletes mentally prepare for competition and practice. This includes many of the mental skills mentioned above, but applied to specific situations on the athletic field. As part of mental preparation, the role of a sports psychologist includes helping athletes develop mental skills used during pregame or prerace routines. Athletes learn how to focus on the process instead of results and be more proactive with their confidence prior to competition. Preshot routines are another common role of a sports psychologist. Here, athletes learn how to use mental skills to prepare for a specific motor skill, such as a golf shot, free throw, or field goal kick. Another common role of a sports psychologist is to help athletes improve the quality or efficiency of their practice. Many athletes, such as collegiate athletes, have limited practice time. Coaches want to help these athletes get the most out of their practice time by understanding principles of motor learning and performance.